This accordion fold book pays tribute to the Silent Sentinels who stood vigil at the White House for two and a half years to gain the right for women to vote. 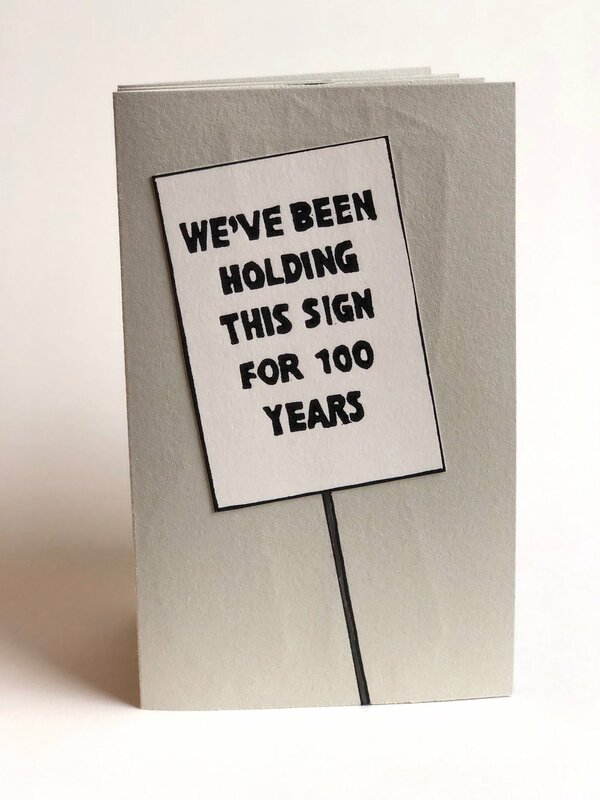 They held their ground from January of 1917 until June of 1919 when the House and Senate passed the 19th amendment. By November of 1920, 8.4 million women exercised their right to vote. The edition is 35 copies. There are six block-printed pages, each hand painted and stenciled. Limited edition book, 18 copies, 2017. I've finished the first copies of my new edition "Wanderlust", a tribute to my Father. I made prints from drawings he made when he was a soldier in the 50's (the map of Europe and the Panama Canal). The other pages are drawn using silverpoint, ink and gold leaf. I made a paper copy of a farthing, a coin in his collection that I have always loved. It sits in the box made by Erin Fletcher of Herringbone Bindery. The prints were done by Rob Charlton at Goosefish Press. Each of these bridges represents a moment in time when we’ve almost made it to our destination. They are landmarks on a leisurely evening stroll or a white-knuckle drive across a vast expanse of water at the close of a long day. They are magnificent steel structures that bring to mind the places and family at our journey’s end. The beauty is in the crossing. We are almost home. The bridges included are the Zakim, Congress Street, and Northern Avenue Bridge in Boston, the Brooklyn Bridge in New York, and the Mackinaw Bridge in Michigan and the International Bridge connecting Sault Ste. Marie, Michigan and Canada. The clamshell box was made by Erin Fletcher of Herringbone Bindery in Boston. 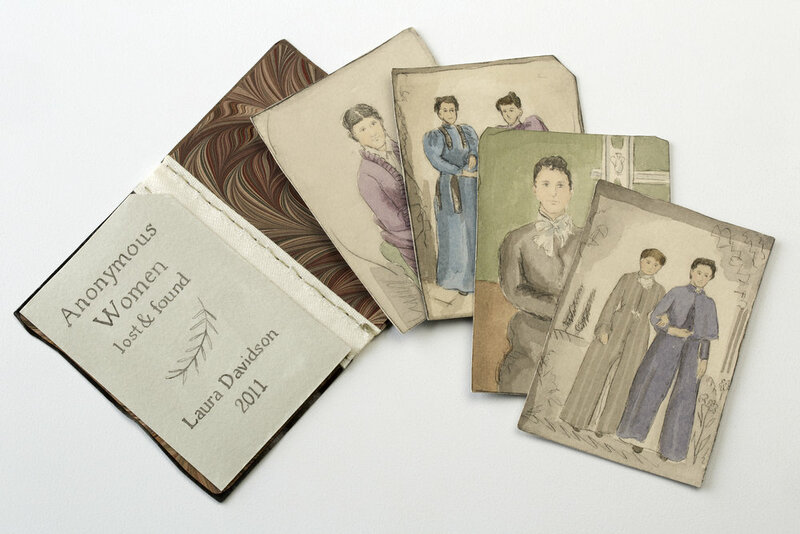 A limited edition folio of nine hand-colored drypoint prints based on tintype portraits of women on Magnani Pescia paper. These tintypes were found at various flea markets, and antique shops with piles of other portraits of unknown people. After bringing them to my studio, and having them on my walls for years, they became part of a group once again. The covers of the folio are two tintypes sewn together with a ribbon spine and marbled end pages. The title page and text on the reverse side is written with ink. The text refers to the identities of the women being lost to the passage of time. The box is made from walnut, and holds a small silverpoint drawn title. The edition is 12 copies from 2011. This book pays homage to Gertrude Stein's 1914 work Tender Buttons. The text is typed on Frankfurt paper. The illustrated buttons are painted with ink and wash. The circles are bound together with ribbon. The brass box is lined with more text, and buttons are sewn on the lid. This deck is based on my research of the history of playing cards, especially transformation decks. There are 54 cards, a full deck plus 2 jokers, housed in a mahogany box, with a signed colophon. The cards are each hand painted dry-point prints on magnani pescia paper; the face cards are ornamented with 23 c. gold gilt crowns for the King and Queen cards and the colophon, and aluminum leaf crowns for the Jacks. On the reverse, each card is linoleum printed in tan and white. EVERY NIB is a tactile catalog of the nibs and pens I use in my work. The box opens to reveal a book and seven realistic looking pen nibs made from formed painted paper. The accordion book is bound with wire and sewn with linen. Five pages each have block printed images of five pen nibs with catalog info about each nib written in ink. On each page there is also a delicately drawn pen in silverpoint. 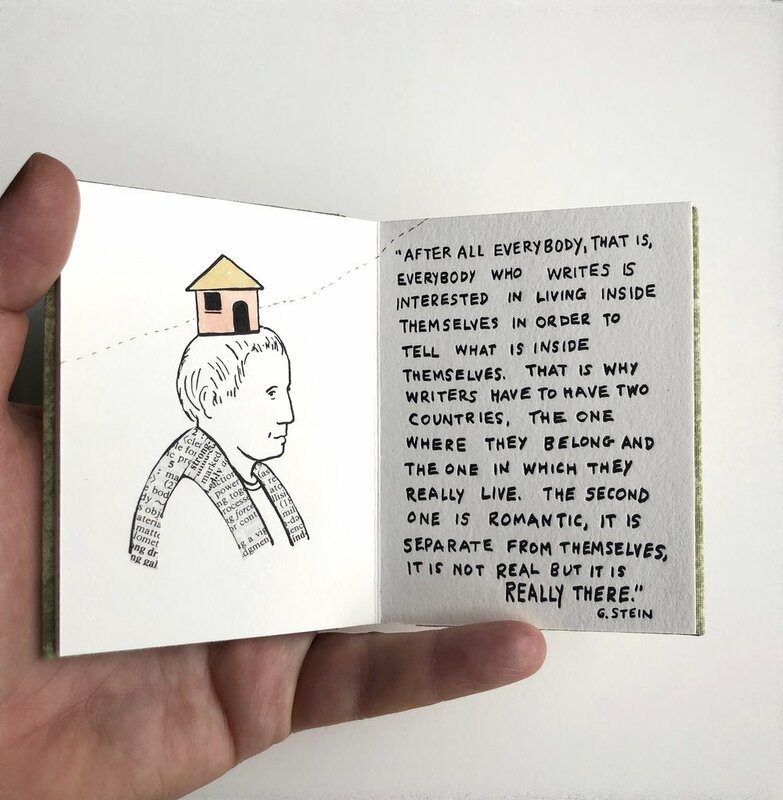 The sixth page is the artist’s statement written with a Sheaffers fountain pen, circa 1940, and includes a silverpoint portrait of that pen. There is a colophon on the reverse side. The custom clamshell box is made by Marie Oedel, with labels and tray papers drawn in pen and ink wash. The grey clamshell box is housed in a card stock fold-over portfolio with an original lino cut of a pen nib on the spine. This edition from 2012 is 18 copies, each signed and numbered. The price is $1500. A small edition of hand colored dry point prints depicting well-designed and useful kitchen tools. 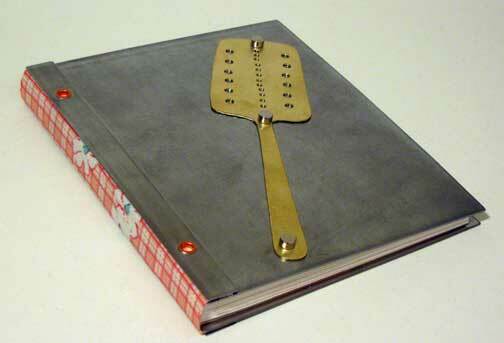 The end pages are a linoleum print grid pattern of knives and forks. The cover is stainless steel bound with a retro fabric that recalls an apron. On the cover is a brass spatula held on by magnets. There are 10 dry point prints and 4 linoleum prints. This is a small edition, 7 copies, of hand colored dry point prints depicting nine cities that I have visited and drawn. Each page has hand written text naming the buildings and views, and each has 22 c. gold details. There are 10 prints. The cover measures 2” high by 4 ½ “ long.